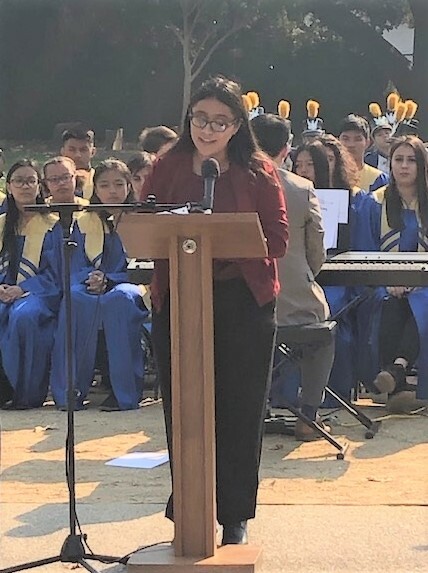 PVHS senior Annett Tamayo delivering her Veterans Day speech in Fernandez Park. This is the transcript of the speech given by PV’s own Annett Tamayo at Fernandez Park during the city’s Veterans Day event. As a senior at PVHS who takes rigorous English courses I’ve come into contact with many words, but when asked to describe the great veterans of this country, the words that come into mind are duty, honor, sacrifice, commitment, and country. By recognizing all of the brave souls who are among us and those who we wish could be here. We as a country will take the first step to thank our veterans and, repay a debt that could never be repaid but one in which we will certainly try. Those in the military go through incredibly hard duties. Fulfilling their obligations no matter how scary it looks like part of a team while keeping integrity in every mission they take is the daily duties of being in the military. Each and every person representing our country is honorable. Committing yourself to the Army, Navy, Marine, Air Force and the coastguard has been a brave and selfless act. It is an act that did not guarantee where you would be deployed when you would be coming home or if that would even happen at all. You and everyone who has been a part of the military has done this for us. Our country, the citizens of this country, and I think I speak for us all when I say that we are extremely grateful for being so brave. So Thank you for doing your duty with honor and commitment for the sake of our country. And to the families. This is a day for you too. For keeping your family together and sticking by them through these tough but brave times. Thank you. I chose to do this speech because I feel like as a citizen I have an obligation to repay a debt to the brave men and women who fought and are fighting for our country. If not for them, we wouldn’t be living in a country that is truly great.